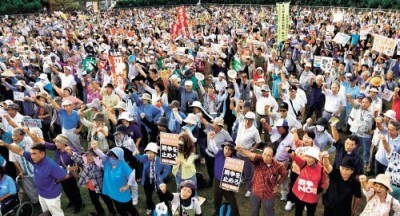 On the evening of August 30, at the Yogi Park in Naha, a rally demanding the scrapping of a new security bill, the cancellation of construction of a new U.S. base in Henoko, and the resignation of the Abe administration was held. According to the organizer, about 2,500 people took part in the rally. The rally was part of action that has taken place nationwide, including near the national parliament in Tokyo, demanding the scrapping of the security bill and the resignation of the Abe administration. To these slogans, the protestors in Okinawa added a slogan against the new U.S. base in Henoko, which is to replace U.S. Marine Corps Air Station Futenma in Ginowan. After the gathering, the participants marched through Kokusai Street to the Okinawa Prefectural Government building, chanting to a rap by a member of the SEALDs RYUKYU, which is a youth group.